Don't read this blog if you are faint of heart or dislike things of slight gore. Or if you have no sense of humor. Credit for some of these ideas go to my dad (from a conversation we had earlier today). Prison overcrowding is a real issue facing today's governing authorities. This is revealed by numerous reports and sources, and the Supreme Court has ruled that "overcrowded prison systems are unconstitutional" (personally, I don't think that medical care and mental health compromises constitute "cruel and unusual punishment" - that should be reserved for, say, tying prisoners to nail beds under a dripping honey trough in an unfloored dungeon which has a large ant population - that might be cruel and unusual). The solution appears to be "release the prisoners." Nope. Execute the inmate with the longest time in the pen. The one who's been there the longest - not released, just executed. "Oh, you were supposed to be released tomorrow? Sorry, your time just expired... shouldn't have committed that crime!" There's a great crime deterrent - any crime could end up carrying a death penalty if the prison gets overcrowded before you're supposed to be released. Now, my addition to this is a simple one: instead of electric chairs, or lethal injections, or any other type of execution method, just convert all the prison cells into large microwave ovens. Then, when execution time comes around, no need to walk the prisoner to a new place (he might attack the guards on the way), just flip a switch, wait a few minutes, and then clean out the cell. But wait: it gets better. That job of cleaning out the cell? Leave that to the next tenant. Now, some would argue, you have to have all sorts of safety devices and procedures in place for this type of system to make sure you don't flip the wrong switch. I say, baloney. How's this for a deterrent: "Another prisoner was accidentally fried by a guard flipping the wrong switch today; John Doe, who was convicted of jaywalking and serving a three-day sentence, was accidentally executed in place of the mass-murderer Jane Doe, whom authorities caught while she was jaywalking with her anonymously named husband." Of course, this system isn't perfect (but it may be better than releasing felons prior to serving their complete sentences), but neither are humans. If you happen to need to cut some wood, let me suggest the Vaughan Bear Saw. I have one like the second on that page, a medium/fine (I guess, might be medium coarse?). Very comfortable to use. Very quick to cut. Very accurate. While working on repairing the frame on our love seat (the front wood brace broke in two, dropping the center of the seat to the floor), I wanted to cut a piece of reinforcing wood to attach to the glued-back-together main frame piece (I'm probably going to find some metal to reinforce the split area as well). The reinforcing piece is a 1"x3" piece of pine. Now, I could have lugged out the radial saw, perfect for the job, but it's so heavy to use for just the one cut... Bear Saw! It took me only a moment to rip through the reinforcement board, with a near-perfect cut (I hadn't bothered to make it exceptionally square, since it would be "free" and not abutted against anything). Similarly, the wooden dowel I used to help position the broken frame board was easily cut with the Bear Saw. (Watch out, by the way: that bear saw is sharp!) FYI, what I did with the dowel was this: cut it slightly longer than the correct spacing between the front and rear frame boards, insert it at an angle between the front and back, and my wife pushed the dowel toward "straight" between them as I pulled and positioned the split frame board. In this way, we managed to work the frame board back to its correct horizontal location (distance from the front board, aligning it with the other side of the split) in spite of the tension on the board from the springs and cords attached to the seating surface. And that's not even the original purpose for which I'd bought the saw. I have a chunk (log) of an old cedar tree, and I wanted to take some slices of the cedar for a craft project. My radial saw was not sufficient due to the diameter of the cedar (about a foot), and any other power saws I had similarly would not suffice. The Bear Saw performed very well at making these slices. Granted, they are not perfectly uniform in thickness - I did not try very hard to make it that way, though, as it is inconsequential to the project (plus, I think the variance adds some character, definitely a home-made look to it). Now, it was hard work, cutting multiple slices off a foot-diameter log of cedar with a hand saw, but it did, in fact, work. And the saw was still sharp enough to easily perform the cuts for the couch-repair project. Oh, and the Bear Saw has replaceable blades as well in the event that it does get dull or broken (I'm not handy enough to sharpen my own saw blades), although they didn't have any replacement blades at the Lowes where I bought the saw. That's OK, though; it will likely be a long time before I use it enough to dull the blade to the point of replacement. I'm sitting on my back patio, and it's chilly out here! The thermometer on the back porch says 53, so maybe it's not that cold, but it sure feels cold - guess it's the relative temperature drop from the summer that's fading into memory. At least I've got my laptop to keep my lap warm... wonder if I could create a device to pump the fan exhaust around my head to keep my ears warm? Oh, and I can see my breath, the moisture from the warm air inside my body condensing as it hits the cool night air. OK, it's too chilly for me now (I'm adding this sentence about halfway through the next section); going inside! According to that page, the "MSRP" is "$20,780" and the "Internet Price" is "$19,280" (and you can send them contact info to get "Chuck's price" which, I would assume, is even lower). Um, Chuck, the MSRP - from the manufacturer - is "$17,285." Did I miss something? Chuck's "Internet Price" - showing you saving "$1,500 off MSRP" - is actually about two grand higher than the official MSRP from Ford. What's up with that? Now, don't get me wrong, Chuck Stevens is legally able to charge any value they can get for the car (within certain consumer protection provisions, of course - they can't scam you for extra, for instance). But, wait, this seems like a scam. Why are they posting "MSRP" that is, oh, $3,500 more than the MSRP on the official, manufacturer's window sticker? And it's not just this one car. I actually chatted with one of their "internet sales reps" a few months about about this when I noticed it was the case on all the Mustangs on their lot, that the "advertised" MSRP was well inflated above the MSRP on the Ford window sticker. "Oh, that's a clerical error, we'll get it fixed." It was never fixed, and it was apparently a "clerical error" on every car they had on the lot (at least all the ones I looked at). Here we are, a few months later, and all the new Mustangs on their lot once again have inflated MSRPs on their web site. And, again, not just Mustangs, but every vehicle I've looked at on their web inventory. Again I chatted the internet sales rep, a different one (the internet sales manager, actually), and she had no explanation, but "will look into it." When I said, "Honestly, it looks like deceptive sales tactics" - well, she didn't close the chat, but never replied after that. If it's something that they've added, dealer markup, various "dealer add ons," etc., that's fine - but that's not MSRP. Maybe "DSRP" - "Dealer's Suggested Retail Price." But there's nothing on the web site of the vehicle to indicate why the listed "MSRP" is way more than the one that Ford - the manufacturer - put on the window. So, what say you? Is it "false advertising"? Note: Chuck Stevens has multiple brands - I have not attempted to check whether their other lines follow a similar deceptive advertising policy; I don't even know if you can get to the window sticker of other brands online like you can with Fords. I apologize to my regular readers who have no interest in automobiles (other than transportation factors). You may stop reading now and return next time for something more interesting. To those car-head readers, or any Alfisti (Alfa Romeo enthusiasts) out there, please read on! There's a dealer (Classic Cars of Plano) in Texas with some interesting Alfa Romeos for sale. I say interesting, because they were never actually for sale in the US originally (and they both have speedometers marked in "KPH" - not "MPH"). If you happen to buy one (or both!) of these, and live anywhere near the Mobile/Pensacola area, please let me know - I'd love to come take a look (or a spin, if you're so inclined). I'd consider buying them myself, but there are other things that are of more importance right now (reliable transportation, college tuition for the kids, etc.). That's right: automakers are going to have to increase fuel efficiency of their fleets, and that is going to save you money at the pump. I haven't quite figured out how the increase in efficiency of cars I don't own is going to save me money, but according to the article, the agreement for model years 2012-2016 (35.5 mpg) will start saving families money at the pump this year. Cool, huh? These new standards will also "spur economic growth" - you know, by ... well, I'm not really sure. Reducing income of oil companies. Increasing income of automotive manufacturers (since you'll have to pay for all that fancy engineering to double the average fuel economy of vehicles in a decade and a half). Here's something else they should think about: ethanol vs. gasoline. Ethanol is not as efficient as gasoline. (Do your own research, but I'll give some links to get you started later.) E10 (10% ethanol) is generally 3-4% less efficient than 100% gasoline, while E85 (85% ethanol) is 25-30% less efficient. Now, recently, ethanol blends are slightly cheaper than "real" gasoline, which helps offset the reduced efficiency when looking at "cost per mile" - but this doesn't take into account the reduced efficiency from increased fueling frequency (say you're on an interstate trip - every time you stop for fuel, you're typically reducing your efficiency because of the energy spent in heating the brakes while slowing, excess energy spent to accelerate to interstate speeds vs. the amount of energy spent maintaining that speed, etc.). However, engineering engines to run on various fuel sources, vs. optimizing for a particular fuel source, that's going to bring compromises all around. Anyway, back to the original point: requiring increased MPG ratings for a fleet will have an effect on purchasers of the new cars only. There are somewhere north of 250 million passenger vehicles registered in the US, and of those, only 13.5% were less than two years old. So, of those 250 million vehicles, about 34 million are "new" vehicles and will get the fuel savings. And who will save? Those families that can afford to get a new car. How's that for ironic? If you can afford a new car, you will get to save money on fuel! If you can't afford a new car, you get to plod along at your old car's MPG rating, and likely losing money at the pump as the auto makers have to design to new regulations and MPG standards and take advantage of every possible trick to increase MPG, all the while "reduce dependence on foreign oil" pushes more and more ethanol out of the fuel nozzle (and into either your new car designed to run more efficiently on ethanol, or your old gas-burner that will be getting less and less MPG from the fuel that's offered to you, all the while the gov't quietly fails to tell you - other than a sticker on the pump - what you're putting into your car, and those stickers do not mention the reduced efficiency of the fuel in your designed-for-gasoline engine). OK, I'm out of here... enough gloom and doom for one post! Gas. That's the primary infrastructure of the American traveling public. There are gas stations just about everywhere (except at that exit you're about to pass when you really need to stop to unload some liquid instead of loading some). What don't we have at every corner? LPG stations (you know for LPG-powered vehicles). Hydrogen stations (for liquid hydrogen powered vehicles, whether it's a hydrogen burning engine or a hydrogen fuel cell to create electricity from the hydrogen to power an electric motor). 240-volt quick-charging stations (for purely electric vehicles). Granted, these technologies may be coming (or, then again, they may not be). And there's still expense related to these types of vehicles (e.g., the Chevy Volt is much more expensive than the Chevy Cruze Eco - and the Cruze Eco actually has a higher EPA highway mileage rating!). So, what are we to do? Wait? Come on, we're American, we have no patience for that! But wait, there's something else... something that has a decent infrastructure in place already. Something a little more closely related to gasoline: diesel. Typically at any given "fueling location" (that is, a place with multiple gas stations) there's at least one station which sells diesel fuel. Now, currently, we only really have the VW diesels: the TDIs (Golf, Jetta, and Passat). (Note: I know we have plenty of large truck diesels, but I'm talking about fuel-efficient commuter cars.) Granted, there are some BMWs, but they're more on the luxury end of the market. Why do I mention this? Because I think we're missing out. Generations of Americans have been spoiled by relatively low fuel prices. Horsepower has been the ruling stat in American vehicles, and diesel engines just don't put out the horsepower of their gasoline counterparts. Fuel economy might be better, but most people weren't concerned about that "MPG" stat, instead looking at the "HP" number and 0-60 times from magazines and (later) web sites. Diesel engines? Those were the noisy, stinky, black-smoke-belching engines found in semis, some pickup trucks, and old, slow Mercedes. Consider the Mini Cooper D (not available in the US): 0-60 in 8.9 seconds, 41mpg over the course of Car & Driver's two-week test, and "the sporty and fun driving experience we’re used to in gas-fired versions" - while beating the 30 and 23 mpg averages that C&D experience in regular and S model Coopers. (Note: the Mini diesel does not meet American emission standards, so would require some reworking to be sold here.) Similarly, the Fiat 500 diesel gets 56 mpg on the EU combined cycle. It's only a bit over a second slower to 60 than the gas-powered 500. So, why don't we have some of these diesels in the US? Probably perception: they won't be "accepted" by US buyers, so going through the trouble of certifying them for American standards would seem to be a wasted expense. But VW's TDIs seem to sell pretty well, and with current gas prices, I think more people might be interested in the diesels than most marketing types would guess. Besides the efficiency improvements, there are some other advantages to diesels. One is torque: because of the difference in the operating characteristics, diesel engines are much torquier than their gasoline counterparts. For instance, that Mini diesel puts out as much torque as the much-higher-horsepower Cooper S model, and the Fiat 1.3 diesel puts out about 50% more torque than the 1.4 gas engine. Torque is what you "feel" when accelerating - that's why a good ol' V8 engine "feels" so good and powerful. They (diesels) won't rev as high as a gas engine, which is why they don't produce as much horsepower, but in most driving scenarios (other than running 0-60 or a 1/4-mile on a drag strip), the torque advantage more than offsets any lack of high-end power. Diesels also generally are longer-lasting engines - they are built stronger (they have to be to withstand the diesel operating characteristics), and generally have fewer things to go wrong (e.g., no spark plugs or ignition system). And, of course, there's that improved fuel economy. I really hope that small diesels make their way into the US. Mini, Fiat, even GM has some small diesels (initially engineered in conjunction with Fiat) that they could put into the Sonic line of cars (among others). Small, light-weight, great-handling, "fun" little cars, with torquey diesel engines that get awesome mileage (even if they're slower on a drag strip than their gasoline-powered brethren) - that's what I'd like to see, and I think they may be more popular than some automotive executives might think, especially if advertised correctly. And, the more they sell, the more word-of-mouth advertising will get around, improving the reputation of "little diesels" even more. In a recent trip to my local Kia dealer, Team Gunther Kia (so they could repair a flat when I got a key stuck in my tire with 7k miles on it - which they did for free! ), I decided, since I was going to be there anyway, to take a quick look at the Kia Rio. The new one, the 2012 model. Why? Well, I have been very interested in the new Chevy Sonic (particularly with the turbo motor), and in one article or another it was compared with the Hyundai Accent, and by extension the Rio. The Accent/Rio has a 138hp GDI motor (that's "Gasoline Direct Injection" - that is, instead of the fuel being mixed with air and then sucked into the motor, only air flows through the intake valves, and the fuel is directly injected into the cylinder; check out this article if you want to know more). That's the same output as the 1.4L direct injection turbo in the Sonic (actually, the Sonic's 1.8L naturally aspirated motor generates the same horsepower, but less torque, as does the Hyundai GDI motor). And both cars hit the 40 mpg mark (with a manual transmission, on the EPA highway test circuit). So, I thought I'd go ahead and take a look at the Rio while I was waiting on the tire to be repaired (again, at no cost - thanks, Team Gunther Kia!). I did not drive the Rio, but I did sit in it, and the seats seemed comfortable enough (for the few moments I spent in the car). However, what did impress me, was the solid feeling/sound when I shut the door. Last summer we bought a 2010 Kia Forte for my daughter to take to school with her. She loves the car (my wife loves it, too - she enjoys the way it drives, and, I'll admit, it is a fairly sporty little thing despite its automatic transmission). One thing I do not love about the car is the tinny feeling of the doors. When shutting the door, it sounds, well, hollow, like slamming an aluminum can shut. Not at all like the solid feeling of my much-missed BMW. I figured the Rio, being a "cheaper" car, would follow suit and, if anything, be even less solid of a vehicle. Wrong. The sound of the door shutting was - surprise! - very solid. Maybe not quite as much as the BMW, but then again, the BMW was a 3400 pound car, while the Rio is about 800-900 pounds less. 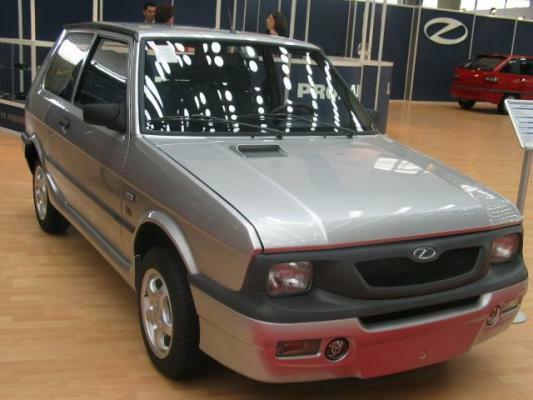 In fact, the Rio felt more substantial, in many ways, than the Forte does. And there's actually room in the back seat, too - although, I'll admit, I only looked there and never actually climbed in. So, was I impressed? Considering the vehicle, yes. Granted, I don't think it'll be my choice for when I need to get something as a daily driver (I love the Mustang - but when I get a job working further than a walk up my stairs, I'll want to get something with a little better gas mileage and that I won't mind putting into the bustle - and mileage - of being an everyday driver; as I told the Kia salesman, while I'm working out of my home, it doesn't matter whether my car gets 15-16 mpg or 40 mpg - it's no different when I don't drive anywhere; and, no, I'm not trading in the Mustang!). More than likely I'll go with the Turbo Sonic (reminds me of the old Chevy Sprint Turbo - one of the great "little" cars of the late 80s that I really wanted while in high school). There's a really good comparison test in the latest Car and Driver - and the Sonic finished second to the Honda Fit, but only by two points. Interestingly enough, the Sonic tested was a top-of-the-line LTZ model; the LT model costs a bit less, and might have tied (or beaten!) the Honda in the final points tally (the "as tested price" gave a two-point edge to the Honda). Besides, I've always generally had a liking for Chevy... probably because that's what my grandparents (on my mom's side) drove. 1) Why do "all" magazine- or dealer-type web sites ALWAYS use these infuriating "do you want to take a survey?" roll-over ads, that get in the way of what I wanted to look at when opening the web site, and make me move the mouse to click "get this stupid ad out of my way"? PLEASE, INTERNET, MAKE IT STOP! 2) I really like the service department at Team Gunther Kia. Now, the sales department is "ok" (they eventually gave me an adequate deal on the car we bought for our daughter, including $1k on trade on a 1996 Cadillac DeVille with only the first two gears in its transmission working), but the service department is really nice. Best price on tires for our 2006 Sedona minivan (much better price than, say, Trax Tires or Goodyear - and only slightly more than TireRack), plus they fixed a recall on one of our sliding doors (that we didn't know about, making the door much easier to open instead of sticking like it had been) while they were waiting on the tires to be fetched from a Kia dealer across the bay. And now, after having pulled a key from one of the tires (with about 7k miles on it), they said they'll fix the flat at no charge. Awesome. And the oil change price is about the same as at any "quick lube shop" - plus they always have the (odd-style) filter in stock. Oh, and if you buy a car - warranty for life (as long as you keep up your maintenance).